Watched Theatre : Gowrishankar, Guntur. A large crowd queued up outside Verona Arena, Italy, one of the most renowned places of Italy, eager fans awaiting for the concert of Jordan to start, and amidst all this a dishevelled and unkempt looking rockstar breaks through the clout of cops after a fight into the arena showing complete disregard to his fans, storms onto the stage with a rage and croons to his hearts content. Cut to the past, Janardhan Jakhar (Ranbir Kapoor) a simple haryanvi boy from Pritampura Delhi who yearns to become a big singer someday falls prey to multiple suggestions from people like a gullible person, most intending only to cause mockery. One of the many suggestions is to undergo a heart break or inhabit a pain in the heart because as Khatana, the canteen owner (Kumud Mishra) says, "toote dil se hi sangeet nikalta hai". Janardhan thinks he hasn't seen bad times and to come to the stature of Jim Morrison he has to do something about it. That's it, enters Heer Kaul (Nargis Fakhri) a PYT of the Stephen's College. While the entire college ogles her, Janardhan keeps proposing her for her to humiliate him and in turn give a much needed heart break. That doesn't quite happen, but in the process they both become friends and soon after Janardhan gets coined Jordan and through many highs and lows of his life (read heartbreak), the simple gullible boy turns to an angry Rockstar! You might want to blame your memory for reminding you of Mausam but Rockstar to some extents treads the same path. The film traces the journey of the lead actors from Delhi to Kashmir then to Prague and back to Delhi while each time their love each other remains unrequited. It takes nearly 3 hours to establish the birth of a raged sensation who traverses from wishing he could get away with showing his middle finger as a salute just like Jim Morrison to actually doing it in a fit of rage. Filmmaker Imtiaz Ali who gave Hindi cinema one of the most celebrated romantic films Jab We Met showcases his prowess brilliantly in the first half as he slices and dices the cuts from past to present and back to past. The is simply perfect. The pace is breezy, enjoyable and most importantly relatable and believable. It even gives you glimpses of Jab We Met. However, just when your expectations are hightened with the first half and you look forward to the second you are in for a huge disappointment. As that's when the trite Bollywood cliches seep in. So much to your agony you have a reasonable sick and bed ridden Heer who gets better only when she meets Jordan. He has some apparent "magic" in him to be curing her just by sight so much so that she starts walking, going places and even her medical condition magically improves. And in his absence she again goes back to being sick. The characters too are unevenly sketched. So while on one hand you have the backdrop and characters of middleclass Delhiites perfectly established on the other you see the Kashmiris appearing very caricaturish. They wear kashmiri outfits, despite being in Delhi, their living style is completely like that so much so that you think that if there were no cars in Delhi, you must just find them roaming in Shikaras! Ranbir Kapoor excels in his acting and gives a crackling performance. Nargis appears conscious and has a very distracting pout that makes her appears as if she is overacting! Piyush Mishra as Dhigra is perfect and Kumud Mishra does a swell job throughout the film.A special mention of Shammi Kapoor who lights up the screen in his cameo which can also be called his last appearance on the celluloid. A pleasure and delight to see Shammi Kapoor in complete glory! Music by AR Rahman needs no mention as it already has the nation tuned to it. Cinematography by Anil Mehta is commendable while editing by Aarti Bajaj could be better or remain consistent just as it was in the first half. 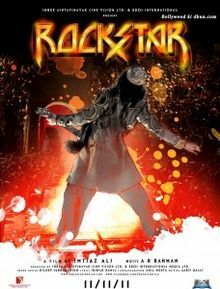 Over all, Rockstar may not be one of the finest attempts but is definitely worth a watch for its pleasing first half and the ace performance of Ranbir Kapoor.